The optimistic nature of Transactional Memory (TM) systems can lead to the concurrent execution of transactions that are later found to conflict. Conflicts degrade scalability, and may lead to aborts that increase wasted work, and degrade performance. A promising approach to reducing conflicts at runtime is dynamically, and transparently, reordering the execution of transactions upon discovery of conflicts. This approach has been explored in Software TMs (STMs), but not in Hardware TMs (HTMs). Furthermore, STM implementations of this approach cannot be ported to HTMs easily. 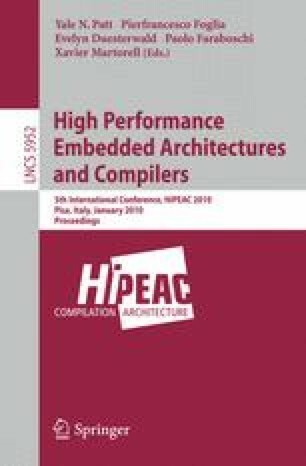 This paper investigates the feasibility of such reordering in HTMs, and presents two designs that are scalable, independent of the on-chip interconnect, require only minor modifications to each core, and add no execution overhead if no conflicts occur. The evaluation takes LogTM-SE as a base line and considers benchmarks with different levels of contention (transactional conflicts). The results show that the preferred design increases HTM performance by up to 17% when contention is low, 57% when contention is high, and never degrades performance. Finally, the designs are orthogonal to LogTM-SE; they require no modification to cache structures, and continue to support transaction virtualization, open and closed unbounded nesting, paging, thread suspension, and thread migration.